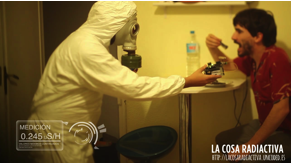 Synopsis: La Cosa Radiactiva is a road trip of engineers, musicians & artists in order to explore several sites related with radioactivity in Spain. We travel fully loaded with our free hardware equipment, designed to measure & visualize the natural radioactivity from earth, as well as the artificial one created by us humans. We organized debates and performances in places with some sort of connection with the history of the nuclear Industry in Spain. We played with the Do It Yourself Geiger counters and tried to bind a connection between. The movie is a compilation of several short pieces recorded during this trip, mainly intended for distribution on Internet. It combines visual expression, debate and scientific divulgation.